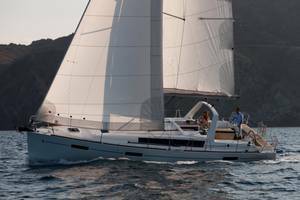 OCEANIS – the ultimate expression in the fine art of cruising is now available in an exclusive run of Limited Edition models created for those searching for supremacy in cruising comfort and luxury. 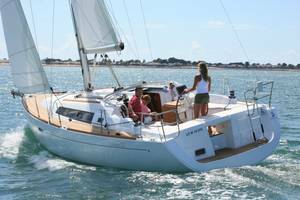 These made in the USA Oceanis sailboats are equipped with an impressive list of features including full Simrad® electronics, autopilot, windlass and unequaled Beneteau seaworthiness; all at an unheard of value. The Limited Edition also offers elegant, exceptional finishes including a beautiful grey hull with white stripes, Ultrasuede® cushions, a choice of decor packages and Jenna® solid surface galley counters. Discover the possibilities! The Limited Edition Oceanis 31, 34 and 37 are only available for a short time with special pricing. Call today for the specs. Don't miss our fine brokerage listings! 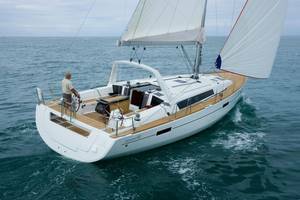 Contact Prestige Yacht Sales in Norwalk, Essex or Mystic today! Simply the best retail boat sales location in the New York, Connecticut, New Jersey area. In Norwalk at Norwalk Cove Marina the location of the Norwalk Boat Show. Prestige Yacht Sales is in Essex at Brewers Dauntless Marina located in the middle of what is considered the, "Boating Mecca of the Shore Line". We are very excited to announce our newest location at Seaport Marine in Mystic, CT.
Salesmanship - Our professional yacht brokers, power and sail, have extensive experience and the desire, ability and tools to get the job done. Thousands of boats have been sold by our staff. You will be impressed with our attitude and our efforts. 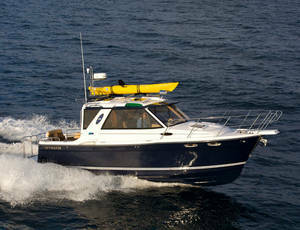 A listing with Prestige will leave you boatless. Presentation - Expertly and attractively prepared listings, elegantly printed on our unique letterhead and packed with descriptive details, graphics, and comments. Please compare our presentation to others, you will be amazed at the difference. Focus - Buying or selling, each customer gets concentrated personal attention. We take our job seriously and focus our efforts on finding you the right boat or getting your boat sold quickly and effectively. Professionalism - Highly respected industry-wide, Prestige Yacht Sales has an unblemished record of achievement in boat sales. As members of The Yacht Brokers Association of America we guide our business practices by their proven code of ethics. Let us be your broker - We are multiple listed and can guide you to a yacht that suits you perfectly - "The art of our work is making the right match." Prestige Yacht Sales is proud to represent “Finder” a 1997 Legacy twin engine Flybridge. Low hours (1550), beautiful dark green awlgrip hull, and nearly flawless varnish in the cap rails and throughout the interior. Always stored inside during the winter, “Finder “has led a pampered life. All cabin windows have been removed and “re-bed”, the bridge ladder has been adjusted for easier access to the bridge and the Yamaha outboard conveniently stores behind the newly angled steps. Once on the bridge you will find complete electronics and a full enclosure with seating for 5!